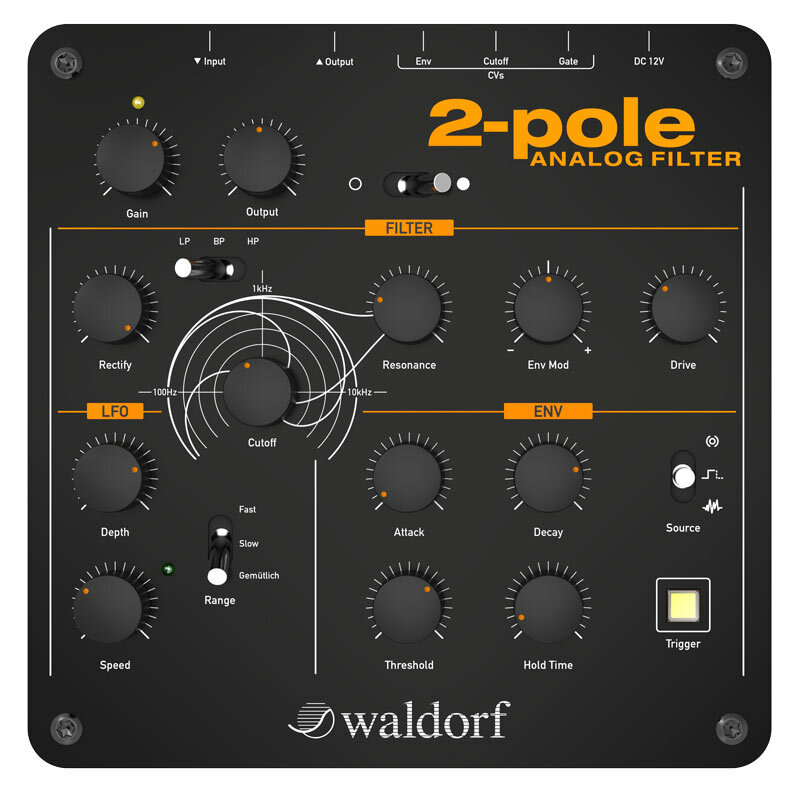 Synth maker Waldorf revealed the 2-pole Analog Filter in the USA at the NAMM show. Now, they’re coming home to Germany with more details. The emphasis here is making a filter for everyone: producers and synthesists, yes, but also DJs and guitarists. We already know guitarists like having access to this stuff if it can be playable (see KOMA, Moog), and if Waldorf can sell DJs a buttery filter instead of the awful stuff you get on many DJ mixers, they may be doing the world a public service. The hardware has an all-analog filter path, which makes sense for a filter, using Waldorf’s own multimode filter design. 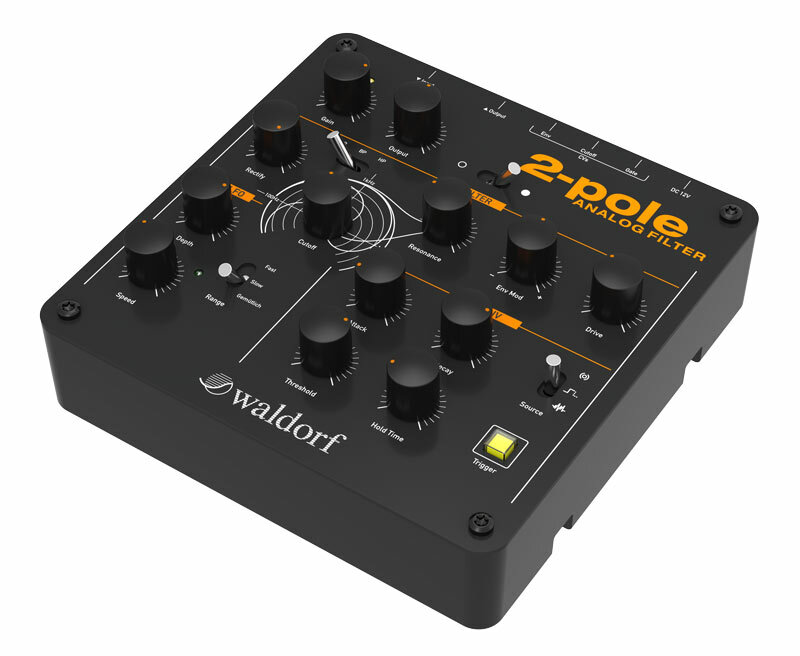 (Waldorf has a track record here, with the 4-Pole, X-Pole, AFB16, Q+, Wave, and Pulse.) To that, they’ve added modulation (LFO, envelope follower, or external signal), and a lot of goodies that let you do more with the sound. To keep this from just being a boring filter, there’s a Rectifier and overdrive after the filter; as you hear in the video, you can make some extreme-squelchy sounds, making this as much an effect as a run-of-the-mill filter. And playability/performance options are what might really justify buying this as dedicated gear. There’s a Trigger button so you can “play” the result, true bypass, CV input for those with other analog gear, foot pedal controls for both the filter and envelope follower. “Funk up your guitar licks.” Or lick up your guitar funk, perhaps. In any case, crank up the modulation and you have some pretty wild sounds. It’s all mono, but you can “cascade to stereo” if you really want to buy two. I could see this box in a rig with gear from someone like KOMA; I’ll be in the booth with them this week, so maybe we can borrow a Waldorf and try mixing all this stuff together. Pricing is 229€ (should see a bit lower than that in America).